Dubai: The UAE’s first Opera will premiere in Dubai in October of next year in line with Expo 2020, it was announced yesterday. Titled Al Wasl, the opera commissioned by Expo 2020 Dubai, will combine Emirati and global talent, bringing to life the UAE’s rich heritage and sharing its innovative spirit with the world. Al Wasl means ‘the connection’ in Arabic and references the historic name for Dubai. The two-hour production will be created by award-winning composer Mohammad Fairouz, and written by librettist Maha Gargash, both of whom are UAE nationals. The narrative will explore the nation’s traditional roots and the UAE as a forward-thinking modern multi-cultural hub. It will especially highlight the country’s “poetic and environmental legacy” and touch on topics related to the survival of the human species, Fairouz told Gulf News. “In opera, you will see the figure of [late] Shaikh Zayed [Bin Sultan Al Nahyan] as the lover of environment that he was — this is a man who planted hundreds of thousands of trees over the course of his life, and made the settlement of the Sir Bani Yas Reserve for the country and greened Abu Dhabi to the point where we have it today,” he said. The poetry and legacy of His Highness Shaikh Mohammad Bin Rashid Al Maktoum, Vice-President and Prime Minister of the UAE and Ruler of Dubai, will also be highlighted in the opera, along with his discovery of the 4,000-year-old ring at the Sarug Al Hadid archeological site. The ring was used as a source of inspiration behind the official Expo 2020 logo. Carried out in English and Arabic, the opera will also incorporate other languages and see the participation of globally renowned names, which will be announced nearer its launch. It will also have a comprehensive education and outreach component, providing a series of creative initiatives including masterclasses, casting opportunities and open dress rehearsals, as well as certified courses in costume design, stage make-up and theatrical wig design. “In the UAE, we find inspiration in the present by looking to our history with pride and our future with hope. Al Wasl shines a light on the rich history of our people and nation, and how we embrace the whole world with humanity and generosity,” said Fairouz. Renowned for his operatic works uch as Sumeida’s Song, The New Prince and Bhutto, Emirati Mohammad Fairouz is known for his large-scale compositions that engage geopolitical and philosophical themes. He has been hailed by The New York Times as “an important new artistic voice” and by BBC World News as “one of the most talented composers of his generation”. “I wrote my first opera at the age of 22, and it was about four characters within a house,” he said. “My second — The New Prince — takes place in the city-state as a national entity, and my third — Bhutto, was about Benazir Bhutto’s life,” added Fairouz. 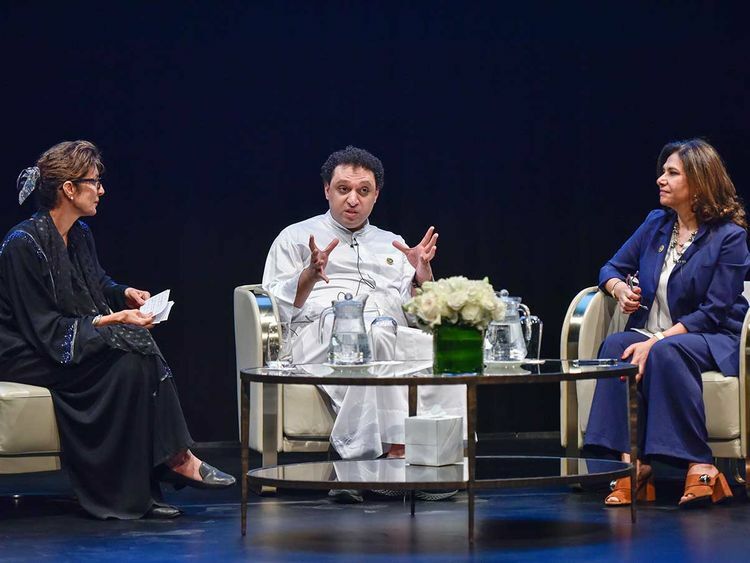 Describing the upcoming opera in the UAE as his biggest challenge yet, Fairouz said it’s about the universal embrace and spirit. “It’s about the world in which we live, not simply as humanity but as the world at large with all the living things of the planet and how we learn how to live together,” he explained.